Congratulations, you have launched your new site! Now here’s what you need to know. SSL- SSL refers to the security of the connection between your computer and the server which holds your site. All sites hosted with us have a encrypted or protected connection, although depending on your hosting package the ssl certificate may be signed or un-signed. If you are a Bronze hosting member this certificate will be self-signed, which means browsers* will not recognize the certificate and likely warn you that it cannot be trusted. Please ignore this message and proceed to edit the site. Levels above Bronze will be issued a signed or recognized certificate, this will not prompt you with any message. You can tell when you are using a secure connection, by looking at your address bar. When using https://www… you are using a secure connection we typically only set up the site to use this secure connection when you are in an editor. When you are using http://www… you are not. This secure connection is only really necessary when you are editing the site not just viewing it. *Note: Browsers will only give you this warning when you login to your site not when someone is simply viewing it. Both of the pictures above are using Google Chrome as the browser. Posting Content – One of the many reasons we prefer to use WordPress as our content management system is how easy it is to use. Adding and editing content is simple and doesn’t require you to call a web design whenever you want to change what a page says. Remember if you signed up for an SEO package, when you enter content you want to include the terms identified as key terms in your SEO training. By consistently adding search engine optimized content to your site on a regular basis you greatly increase your chance of moving up through the Google search rankings. 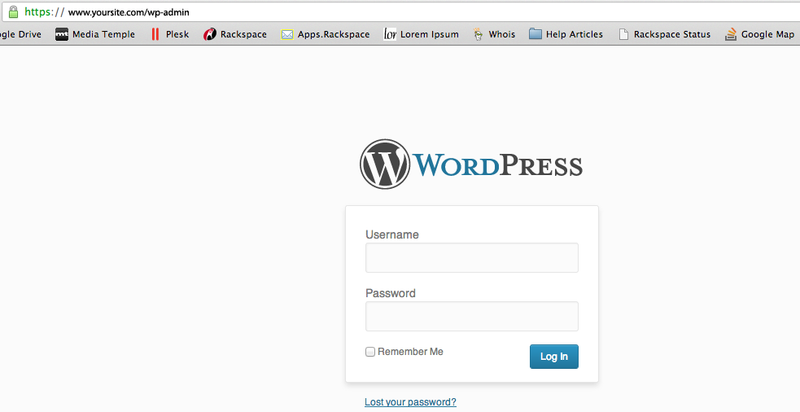 For a tutorial of the basics of using WordPress click here. For an Explanation of what SEO is and what to expect click here.